A short ferry ride away from St. Malo, the island nation of Jersey in the Channel is physically closer to Bretagne, but culturally aligns more closely with Britain. If you look at all the Channel Islands, it doesn't make any sense at all that they use the UK telephone country code (+44) and not the French (+33). But of all the Channel Islands, Jersey retains the strongest link to its French roots: it's très Fritish, so Brench. Names of areas on the island-nation include Les Vaux, Les Creux, La Haule, and Le Portelet. Virtually every road is named in French: La Route de la Baie, Rue du Pont Marquet, Petite Route des Mielles, Le Mont des Grupieaux. The names on the island seem to have been a mix from way back: Here, the crossbowmen from 1341 are listed as Adam, Guillaume, Jean, and John. I can only imagine what language they spoke to each other (14th century French or English? Or both?). And then there's the Mont Orgeuil Castle (meaning Mount Pride, in English), overlooking the eastern end of the island -- the side closest to France. It's not there to protect France, but rather as the final, closest bastion of the English protecting against the French. The oldest parts of the castle date from the 13th century, with the newest additions to it during World War II. In fact, the island declared its loyalty to the British crown in 1204, and they don't seem to have wavered much since. They drive on the left hand side of the road; they proudly advertise the full English breakfast of beans, bacon, tomatoes, and toast; they serve up their scones and tea and fish-n-chips (or, in this case fish-n-chips sandwich) and sticky toffee pudding (which, to an American, is a cake, not a pudding) with gusto. Their telephone booths (those ancient relics) are yellow rather than red, but still rather photogenic. Yet you can still the influence left from before the 13th century, when the island was under the control of the Duke of Normandy, with his lion symbols. 1204 is only about 150 years after the Duke of Normandy, William the Conqueror, became Kind of England in 1066. So basically, the islanders kept their loyalties with the same Duke's descendants, despite the change of country. On this medieval monarchy family tree, you can see how intertwined the British and French are: it starts with Louis XII of France, Henry II of England, and Eleanor of Aquitaine (12th century). It runs through John of England (also 12th century), Henry III of England, Louis X of France and Philip V of France (both 14th century), Richard II and Henry IV of England (14th), Charles VIII and Louis XI and Louis XII of France (15th century). There's Elizabeth of York, Margaret of Anjou, Mary Tudor, and Jeanne of Bourbon. One of the most famous figures intertwined with the history of the castle is Sir Walter Raleigh, favorite of Queen Elizabeth in the 16th century. He was sent here to demolish Mont Orgeuil, but instead turned it into a military fortress, and took up residence in a newer castle named, appropriately, Elizabeth Castle, when he became governor of the island in 1600. The castle did not do its job in World War II, however, where it was simply too close to the French coast to keep safe. The Nazis occupied Jersey, and there is still a strong World War II legacy here (and on the nearby island of Guernsey, and the other smaller Channel islands). These islanders were the only residents loyal to the British Crown (not exactly British citizens, but closely linked) who actually were occupied during the war. But when you're on an island that feels nearly tropical (even if you're just off the coast of northern France in the English Channel), a vacation is not just about history. Jersey is a small place, and so it's easy to pack things in. In just a couple days, our family goes segway riding, trampoline jumping, horse-back riding (no falls), and both banana boat and sofa riding (it's a real thing; Pippa gets a little hurt in a freak rope-to-mouth accident, but other than that it's a blast). We do not actually skydive on this trip, but evidently, it's a thing people do here. And yes, we admit it, though it looks nearly tropical, the water does not feel nearly tropical. It feels nearly glacial. We spend plenty of time at the beach. And plenty of time eating. We are pseudo-quasi French in a pseudo-quasi French location, after all. And, in case you're wondering, Jersey Royals, listed on the sign above, are not Prince William and Princess Kate, though the locals to remain loyal to the British royals, even after 800 years. Rather, Jersey Royals are special new potatoes cultivated under a layer of seaweed, which supposedly imparts flavor and saltiness. Whatever the reason, Gigi does declare them the most delicious potatoes she's ever eaten -- and coming from a potato girl, that means something. It's important to note that though the phone code is +44, and the maps show it as "Jersey, UK", Jersey and the other Channel Islands are not part of the United Kingdom. They are territories dependent on the crown, but Jersey has its own United Nations country code, its own elected government, and the people -- known quaintly as Jersey Beans -- are not given full British citizenship or passports, and are not part of the E.U. They even have their own money, tied to the British pound, printed in both English and French, with a picture of Queen Elizabeth II on it. Jersey Frais is a soft, spreadable cheese cow cheese made not in Jersey, but rather in Maulevrier, which is about as far away from the coast off of which Jersey island lies as you can be in Bretagne. At the base, it's made with fresh cheese, cream, and salt. The company that makes it, Gaborit Bernard, promotes it for "tartines" -- bread with stuff spread on it, like an open faced-sandwich -- topped with pepper or dill or curry or cucumbers (cucumber and cream cheese sandwich: how very British). It's organic, soft, creamy, and mild, and quite yummy spread on toast, in fact, with or without the cucumbers. All of the milk comes from Jersey breed cows. When you're on Jersey, it's hard to forget that they're proud of the breed of cows that bear the island's name, and of the dairy products that are made here. 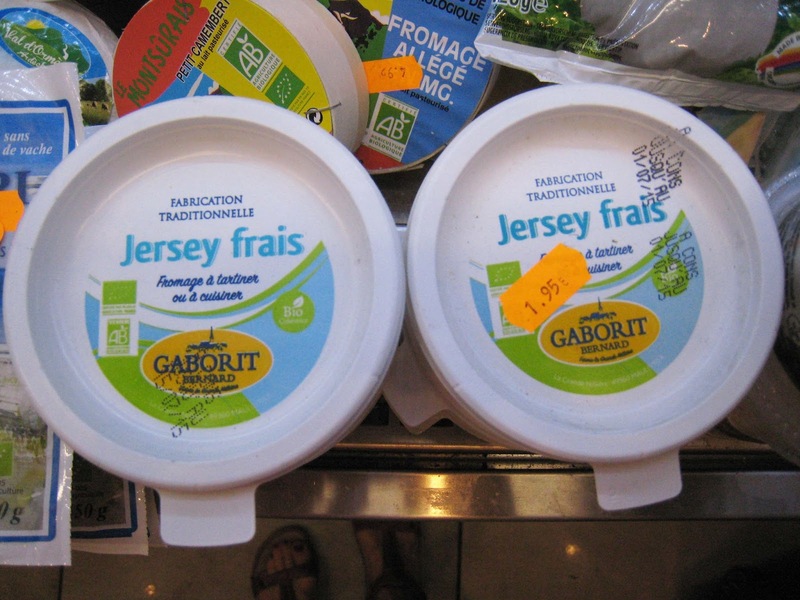 Jersey Frais is not actually made on Jersey, but rather in France. And it's not even made on the Bretagne coast facing Jersey. Instead, it's named for the Jersey breed cows that produce the milk for the cheese, and therein lies the real connection, as Jersey cows are named for the isle of Jersey.